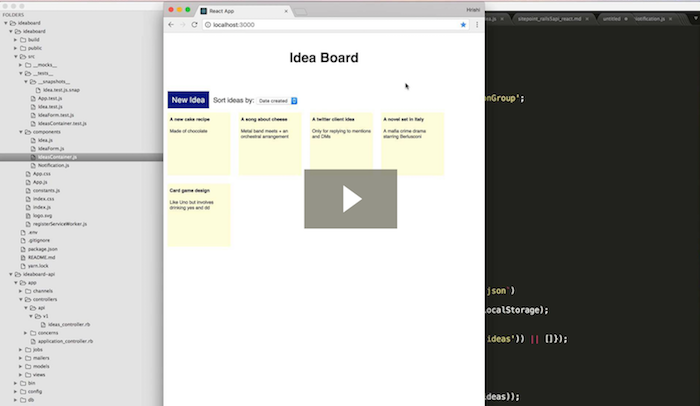 In this hands-on tutorial, we’re going to build a React app that works with a Rails 5.1 API. You can watch a video version of this tutorial here. To follow this tutorial, you need to be comfortable with Rails and know the basics of React. If you don’t use Rails, you can also build the API in the language or framework of your choice, and just use this tutorial for the React part. The tutorial covers stateless functional components, class-based components, using Create React App, use of axios for making API calls, immutability-helper and more. 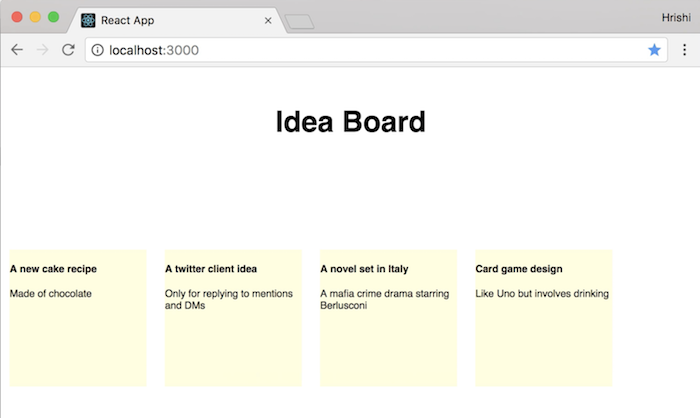 We’re going to build an idea board as a single page app (SPA), which displays ideas in the form of square tiles. You can add new ideas, edit them and delete them. Ideas get auto-saved when the user focuses out of the editing form. At the end of this tutorial, we’ll have a functional CRUD app, to which we can add some enhancements, such as animations, sorting and search in a future tutorial. Let’s get started by building the Rails API. We’ll use the in-built feature of Rails for building API-only apps. Make sure you have version 5.1 or higher of the Rails gem installed. At the time of writing this tutorial, 5.1.3 is the latest stable release, so that’s what we’ll use. Then generate a new Rails API app with the --api flag. Next, let’s create the data model. We only need one data model for ideas with two fields — a title and a body, both of type string. Now that we’ve created an ideas table in our database, let’s seed it with some records so that we have some ideas to display. Note that the controller is under app/controllers/api/v1 because we’re versioning our API. This is a good practice to avoid breaking changes and provide some backwards compatibility with our API. Alright, now let’s test our first API endpoint! We can also test the endpoint in a browser by going to http://localhost:3001/api/v1/ideas. 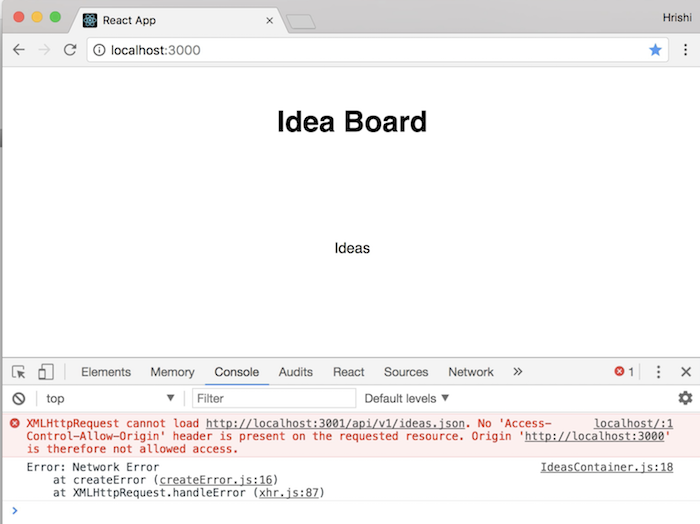 Now that we have a basic API, let’s set up our front-end React app using Create React App. Create React App is a project by Facebook that helps you get started with a React app quickly without any configuration. 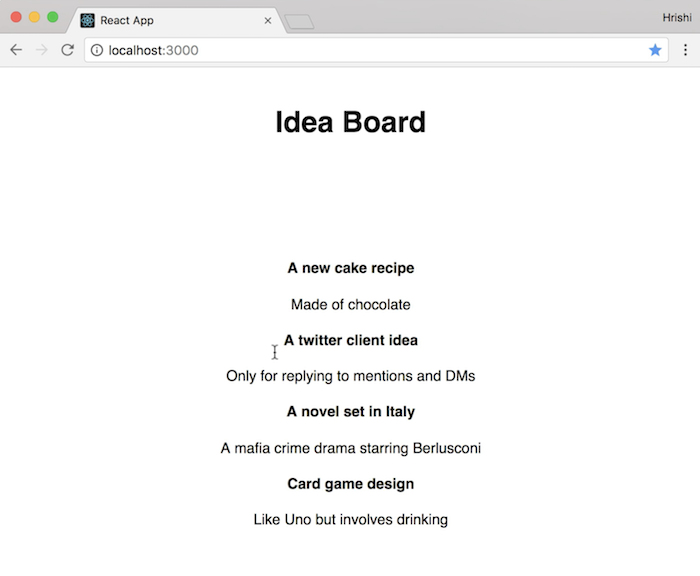 That will generate a React app called ideaboard, which we’ll now use to talk to our Rails API. This will open it on http://localhost:3000. 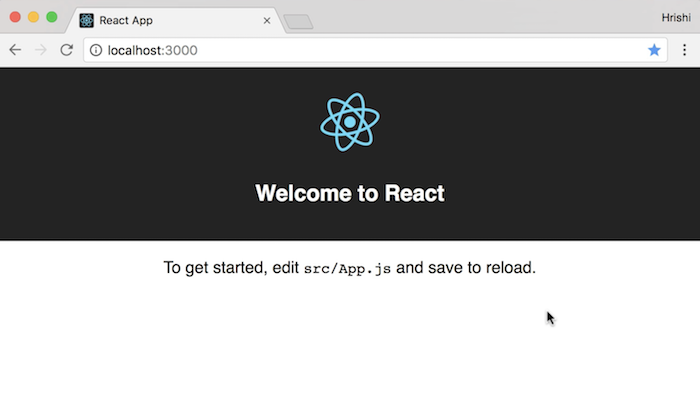 The app has a default page with a React component called App that displays the React logo and a welcome message. Our next step is to edit this file to use the API we just created and list all the ideas on the page. 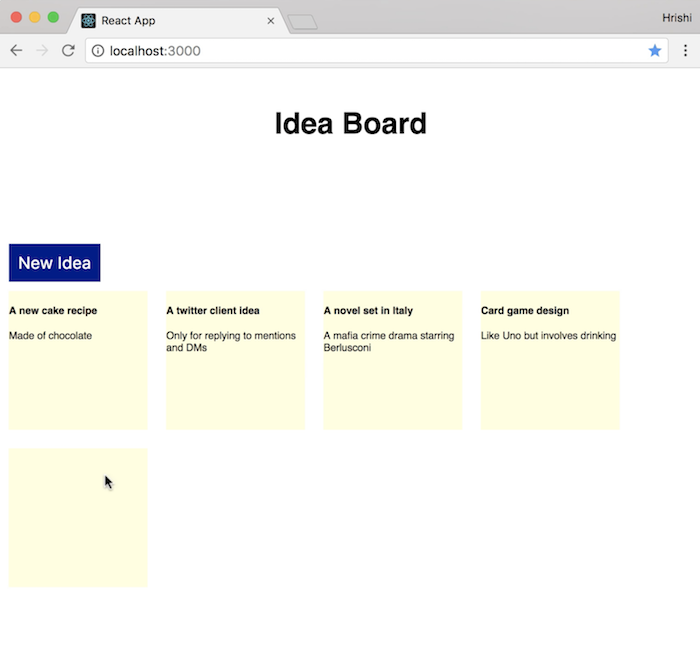 Let’s start off by replacing the Welcome message with an h1 tag with the title of our app ‘Idea Board’. Let’s create this IdeasContainer component in a new file in src/IdeasContainer.js under a src/components directory. This component needs to talk to our Rails API endpoint for getting all ideas and display them. We’ll make an Ajax call to the API in the componentDidMount() lifecycle method of the IdeasContainer component and store the ideas in the component state. And then we’ll update the state in componentDidMount(). Let’s use the axios library for making the API calls. You can also use fetch or jQuery if you prefer those. Now if we refresh the page … it won’t work! We’ll get a “No Access-Control-Allow-Origin header present” error, because our API is on a different port and we haven’t enabled Cross Origin Resource Sharing (CORS). So let’s first enable CORS using the rack-cors gem in our Rails app. We restrict the origins to our front-end app at http://localhost:3000 and allow access to the standard REST API endpoint methods for all resources. Now we need to restart the Rails server, and if we refresh the browser, we’ll no longer get the CORS error. The page will load fine and we can see the response data logged in the console. So now that we know we’re able to fetch ideas from our API, let’s use them in our React component. That will display all the ideas on the page now. Note the key attribute on the tile div. We need to include it when creating lists of elements. Keys help React identify which items have changed, are added, or are removed. We set the height, width, background color and make the tiles float left. Before we proceed, let’s refactor our code so far and move the JSX for the idea tiles into a separate component called Idea. This is a stateless functional component (or as some call it, a “dumb” component), which means that it doesn’t handle any state. It’s a pure function that accepts some data and returns JSX. Great, so that’s the first part of our app complete. 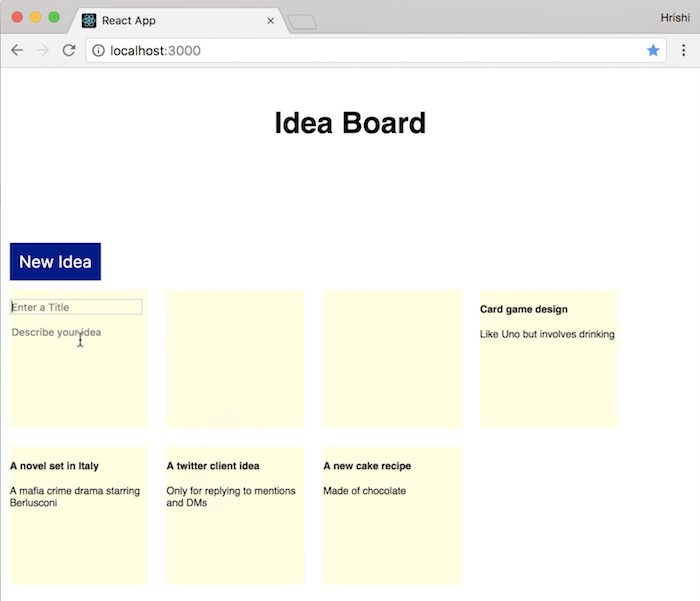 We have an API with an endpoint for getting ideas and a React app for displaying them as tiles on a board! Next, we’ll add a way to create new ideas. Let’s start by adding a button to add a new idea. Now when we click the button, we want another tile to appear with a form to edit the idea. Once we edit the form, we want to submit it to our API to create a new idea. Since Rails uses strong parameters, we define the private method idea_params to whitelist the params we need — title and body. Now we have an API endpoint to which we can post idea data and create new ideas. 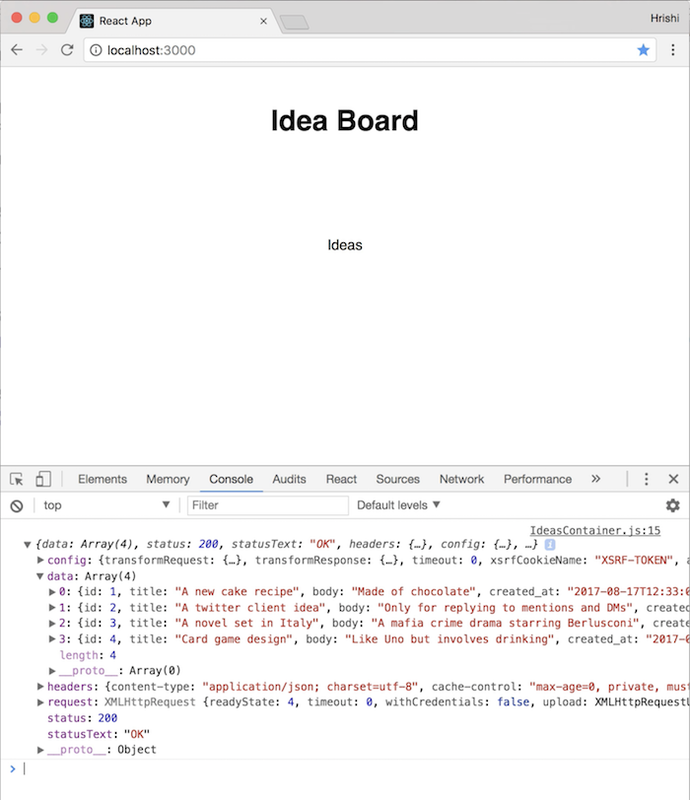 Now if we try clicking on the new idea button in the browser, we’ll see in the console that the response contains a data object with our new idea with a blank title and body. When we refresh the page, we can see an empty tile representing our new idea. 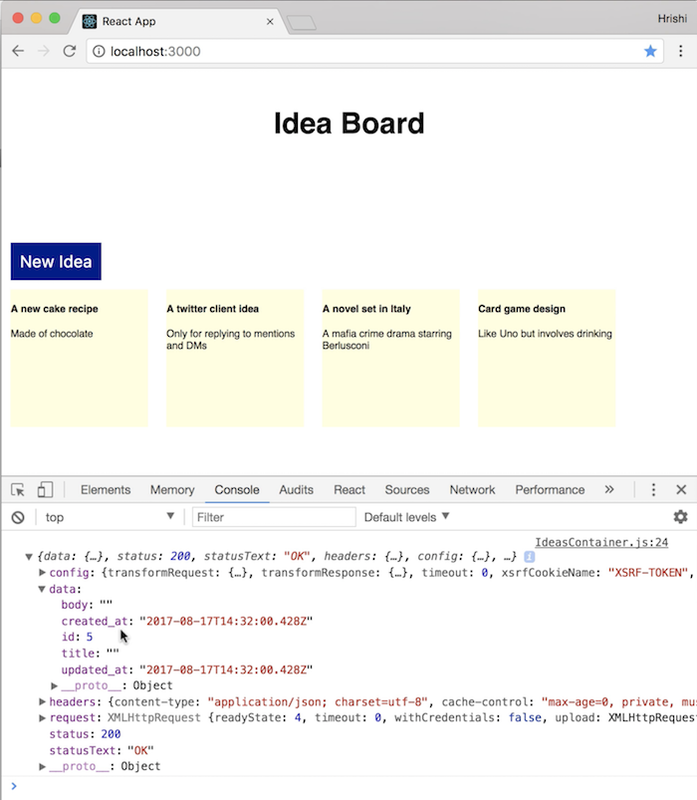 What we really want to happen is that, when we click the new idea button, an idea is created immediately, and a form for editing that idea appears on the page. This way, we can use the same form and logic for editing any idea later on in the tutorial. Before we do that, let’s first order the ideas on the page in reverse chronological order so that the newest ideas appear at the top. Alright, now the latest ideas are displayed first. Now, let’s continue with defining addNewIdea. First, let’s use the response from our POST call to update the array of ideas in the state, so that when we add a new idea it appears on the page immediately. We could just push the new idea to the array, since this is only an example app, but it’s good practice to use immutable data. So let’s use immutability-helper, which is a nice package for updating data without directly mutating it. We make a new copy of this.state.ideas and use the $splice command to insert the new idea (in response.data) at the 0th index of this array. Then we use this new ideas array to update the state using setState. Now if we try the app in the browser and click the new idea button, a new empty tile appears immediately. Now we can proceed with editing this idea. First, we need a new state property editingIdeaId, which keeps track of which idea is being currently edited. So this indicates that we’ve just added a new idea and we want to edit it immediately. Now we can use state.editingIdeaId in the render function, so that instead of displaying just a normal idea tile, we can display a form. Now let’s make this form functional! We need to hook up the form input fields to the state. Let’s see these state changes in action with the React Developer Tools browser extension. You can get it for Chrome here and for Firefox here. Once you have it installed, refresh the app page and open the developer console. You should see a new React tab. When you click on it, you’ll see our app components tree on the left and all the props and state associated with each component on the right. Now we’re updating the form fields, but we’re still not saving the edited idea. So the next thing needed is that, when we blur out of a form field, we want to submit the form and update the idea. Now if we click on the new idea button, edit its title and blur out of that field, we’ll see our API response logged in the console, with the new edited idea data. The same thing happens if we edit the body and blur out of that field. So our onBlur handler works and we can edit our new idea, but we also need to send the edited idea data back up to IdeasContainer so that it can update its own state too. Otherwise, state.ideas won’t have the updated value of the idea we just edited. First, we find the index of the edited idea in the array, and then use the $set command to replace the old value with the new one. Finally, we call setState to update state.ideas. We can see this in action in the browser with the React Developer Tools tab open. Now we can add a new idea and edit it, but the user gets no visual feedback or confirmation when the idea is saved. So let’s add a notification message to tell the user when an idea has been successfully saved. Now every time an idea gets updated, we’ll update state.notification with a success notification we want to show to the user. Now when we edit an idea and blur out of the input field, the idea gets saved and we see the success notification. We also want to reset the notification as soon as the user makes a change that hasn’t been saved yet. Now after a success notification appears, if we edit the idea again, the notification disappears. Next, let’s add the ability to edit an existing idea. When we click on an idea tile, we want to change the tile so that it replaces the Idea component with an IdeaForm component to edit that idea. Then we can edit the idea and it will get saved on blur. In order to add this feature, we need to add a click handler on our idea tiles. So first we need to convert our Idea component from a functional component into a class component and then we can set define a click handler function handleClick for the title and body. Note that we have to add this.props. to use the props value, because unlike in the functional component, we are no longer destructuring the props object. handleClick calls this.props.onClick with the idea id. Now when we click on a tile, it instantly becomes editable! When we click on a tile, once the form appears, let’s also set the cursor focus to the title input field. Notice that we didn’t call this.title.focus() as a separate function after calling setState. Instead, we passed it to setState inside a callback as a second argument. We did this because setState doesn’t always immediately update the component. By passing our focus call in a callback, we make sure that it gets called only after the component has been updated. Now if we try the app in a browser, when we click on an idea tile, it becomes editable with a form and the cursor gets focused inside its title input field. So now we can add and edit ideas. Finally, we want to be able to delete ideas. When we hover over an idea tile, we want a delete button (in the form of a red cross) to appear in the top right corner. Clicking that cross should delete the idea and remove the tile from the board. So let’s start by adding some markup and CSS to display the delete button on hover. Once again, we look up the index of the deleted idea, use update with the $splice command to create a new array of ideas, and then update state.ideas with that. Now we can try it in the browser. When we hover over an idea tile, the red delete button appears. Clicking on it deletes the idea and removes the tile from the board. Hurray, we now have a functional app with all the basic CRUD functionality! In this tutorial, we built a complete CRUD app using a Rails 5.1 API and a front-end React app. Our API has three endpoints, one each for creating, updating and deleting ideas. 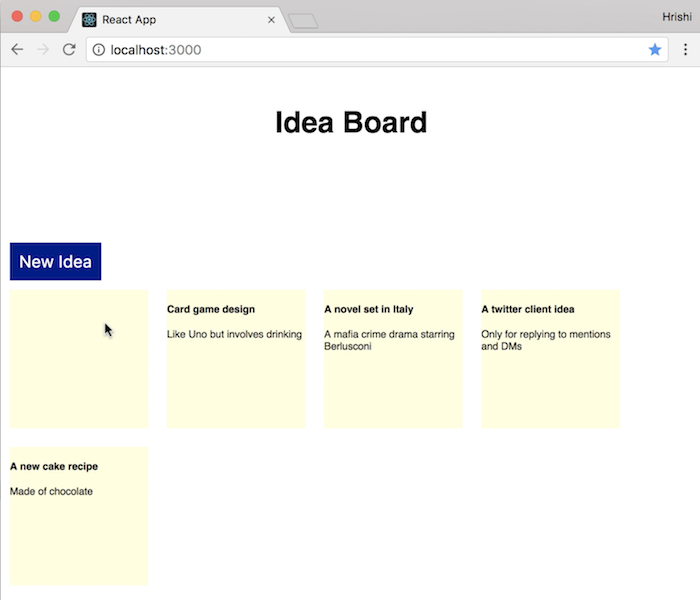 We used Create React App to make our React app. This made setup completely painless and easy. We could dive straight into building our app instead of configuring anything. We used axios for making Ajax calls to the API and immutability-helper to make data updates. In a future tutorial, we can look at how to deploy this app to a production server and also add some animations and transitions to spice up the UI. For example, we could fade in new idea tiles and fade out deleted tiles, fade in and out notification messages. Hi, I'm the founder of Learnetto.com, where I teach React.js to Ruby on Rails developers.